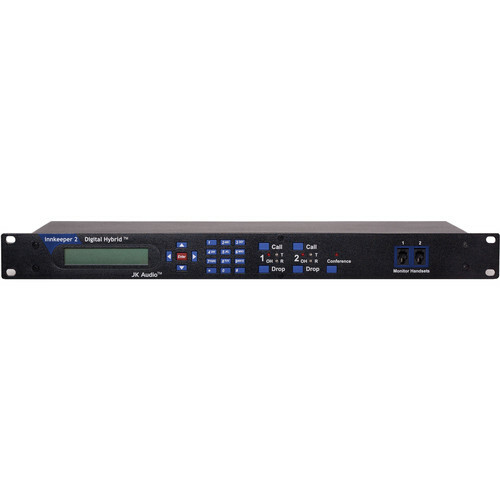 The Innkeeper 2 from JK Audio delivers two digital hybrids housed in a single-rack chassis. The main function of a hybrid is to extract a caller's voice coming in on a phone line, while keeping it separate from the receiver's outgoing audio. Both these streams can then be controlled in various ways. A digital hybrid provides audio that is clearer and cleaner over the variations in quality found in analog hybrids. The front panel hosts a menu-driven keypad, a backlit display, and handset jacks that provide easy speed dialing and call setup. In order to achieve the required separation, an internal digital signal processor (DSP) continuously monitors both the phone line and audio signals. The proprietary echo canceller algorithm can achieve excellent separation, typically exceeding 50 dB without any additional setup. It should be noted that the unit only functions with "wet" phone lines and does not support "dry" (PBX) lines. The keypad and display allow the user to store fifty phone numbers, sorted by name, in a phone list. The display can also be used to set features such as the number of rings before auto answer, master send channel selection, and test tone output. An auxiliary telephone jack is provided for each line that can be used to initiate or screen calls, and is disconnected when the "Call" button is depressed, and reconnected when the "Drop" button is pressed. The Innkeeper 2 features auto answer/auto disconnect for use in interruptible foldback (IFB) and monitoring applications. An included terminal block allows remote off-hook/on-hook control and status for each phone line. A Conference button allows the user to conference together lines 1 and 2 when both lines are off-hook. Applications for the unit include telephone interviews, talk shows, church PA interface, and conference room full-duplex communication. Box Dimensions (LxWxH) 20.3 x 12.6 x 2.7"
Innkeeper 2 Digital Hybrid is rated 5.0 out of 5 by 1.